I periodically update my recommendations and that is the objective of this report. I also spend some time on my analytical approach and investment philosophy. If your investment style is frequent trading, you should not waste your time reading this report. I have four Buy recommendations for stocks that have very significant near term catalysts. These are Cytokinetics, Antares Pharma, Northwest Biotherapeutics and Portola Pharmaceuticals. My five other buy recommendations are Repligen, Cryoport, Bristol-Myers Squibb, Alimera Sciences and Agenus. There are three stocks that I could potentially upgrade; these are pSivida, AMAG Pharmaceuticals and Windtree Therapeutics. In case you are curious about technologies or companies that I am looking at, I have spent the last several months looking at gene editing (CRISPR) and to a lesser extent gene therapy. I think that CRISPR will have a profound impact on human existence. It is still very early days for this technology which reminds me of where Amgen, Genentech and Biogen were in recombinant DNA technology in the 1980s. More on all of this later. I started as an analyst over 40 years ago (time flies) first specializing in the analysis of pharmaceutical companies. In the early years, I followed over 20 leading US companies but pipeline failures forced merger after merger so that this has been winnowed to six giant, multinational companies. Drug development is a very high risk business. I was also an early follower of biotechnology companies as I was the first Wall Street analyst to cover Amgen and actually called on Genentech before they became public a public company. I have visited literally hundreds of biopharma companies over my career (yes you read that right) and listened to the presentations of hundreds more. My longevity has allowed me to see how businesses develop (or not) over not just years, but decades. I also had stints as director of research at Smith Barney and Hambrecht & Quist which provided considerable experience in observing how other analysts approached picking stocks. I have also always managed my own portfolio over the years putting my money where my mouth is. So what have I learned from all of this experience? Absolute humility! Selecting good stocks is extremely difficult. Just when I think I have probably made every type of mistake possible I make a new one. Specializing in biopharma companies also gives an edge in making mistakes as the risk profile in drug development is extremely high relative to most industries. Anyone investing in this area is going to have blowups and I know I certainly have had my share. I provide this history because it has shaped my investment philosophy. I don’t make any claims whether it is better or worse than other approaches-that is for you to judge- but it is mine. Every investment situation is different and past experience may not be a guide to future success or failure, but here is how I go about recommending stocks. I firmly believe that great investing starts with finding great companies or as is often the case for emerging biotechnology, companies that will become great if they successfully develop a product. To do this, you have to have some understanding of the numerous technologies these companies are researching. This presents a particular challenge in biopharma because this requires some understanding of how the drug works in the body which in turn requires some grasp of what it is doing to the body at the cellular or even molecular level. This is a daunting challenge, but I don’t propose that only molecular biologists can have an opinion. Anyway, I hope not because I am a layman. I believe that most investors can come to understand the key aspects of any technology without going into PhD depth, but it requires time and effort. Designing and conducting clinical trials is essential to success. It may be the case that as many drugs fail because of the clinical trial design as because the drug just doesn’t work. Knowing the size of the addressable market and the degree of need for better therapy. The competence of management to manage through the challenging situations that always occur. Successfully commercializing a drug after approval. Managed care now has enormous power and reimbursement issues can sometimes have an enormous negative impact, especially in the early years. Having the ability to raise capital to adequately fund the company through first the clinical development and then commercialization stage. This can depend very importantly on the investment bankers and venture capitalists promoting the stock. There is enormous, highly sophisticated manipulation of stock prices by hedge funds working in concert with trading desks of market makers. I believe that this is one of the largest criminal enterprises in the US. The other important factor(s) that always unexpectedly emerge. Investing is hard work and if you are not willing to put in the time I recommend that you buy an S&P index fund. This is not such a bad idea as the average annual return for the S&P 500 since its inception in 1928 has been approximately 10%. I don’t know if the future will be better or worse, but as long as the US and world economies continue to grow, I would expect continued positive returns. Unless you have decided at this point to put all your money in an S&P index fund (a good conservative strategy), let’s continue on my stock picking approach. I have found through painful experience that I cannot trade stocks on a day to day, week to week or month to month basis. I am not particularly chagrined by this failure because in my 40 years of investing, I haven’t found anyone else who can do it although I have listened to literally thousands who claim that they can. Trading stocks to me is like gambling; the odds are against you. Companies and stocks are different. A company has intrinsic value and over time for good companies, this translates into increasing stock price (not without some bumps in the road). In contrast, stocks are commodities so that their value at any point in time may not reflect the inherent value of the underlying company. Stocks like all commodities are subject to volatile investor sentiment so that in the short term stock prices can be wildly over or under valued when we look back through the prism of time. Investors usually have a herd instinct and are most confident when they share a consensus view, but stocks often are already discounting the consensus so that even if a highly anticipated event occurs it may have no impact. Going with the consensus can work out OK if you are a long term investor, but in the short term you inevitably get caught up in crowd psychology that too often leads to buying high and selling low. Another very real danger in trading is that if you trade out of a great company destined for years of growth and strong stock performance, you may never get back in. This is especially true if you sell a stock and it unexpectedly (for you) increases in price. It is very hard in this case to repurchase a stock so that investors focused on short term trading will often miss great long term opportunities. I think you can guess that you will not see many in and out trading recommendations from me. In 2017, I have made just two recommendations-Cryoport and Portola. One way of highlighting my style of investing is to take a look at my antithesis, the TV personality Jim Cramer. I pride myself on knowing what is required to be a competent analyst based on my personal experience, managing hundreds of analysts as research director and observing other analysts. Watching Cramer to me is like a highly trained chef watching someone scramble eggs. Humility is not Cramer’s long suit as he swaggers about the TV set continually reminding us that he is the smartest investor on the planet. He believes that he can interview a management for the first time and based on a few minutes of conversation tells us that he understands the salient investment issues of the company and can instantaneously make a brilliant investment decision. Believe me folks, it doesn’t work like that. It takes a considerable amount of time to analyze a company and to get a feel for the stock price. 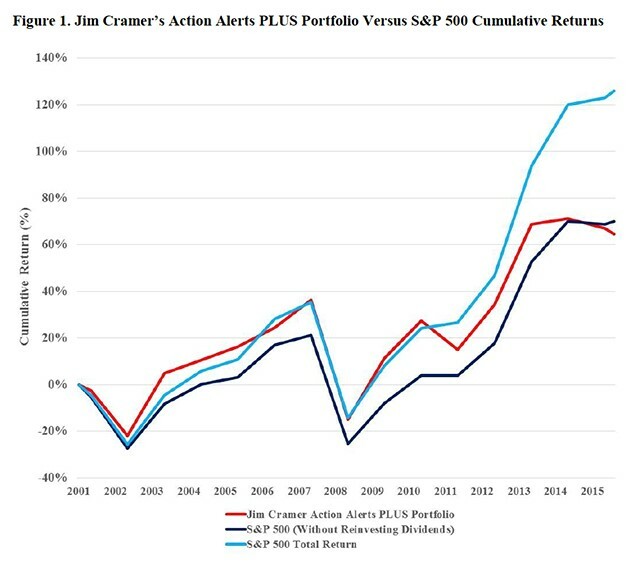 The Cramer formula is one of disaster for individual investors. Despite my disdain for his investment style/ prowess, Cramer has a wide following so I have to ask myself if I am wrong or envious or both. I don’t think so. He is peddling the idea that he can trade stocks and come up with new ideas on a daily basis. He promises great profits if you trade along with him. However, the dazzling number of recommendations (mostly buy) that he makes each year are impossible for an investor to follow unless it is your strategy to invest in or trade in hundreds of stocks. He also follows the time honored strategy for market pundits of reminding investors of his successes while forgetting his mistakes. So how has Cramer done over the years? Business professors at the Wharton School recently released a study which tracks the performance of his best ideas. They compare the cumulative return of (1) the S&P 500 index, (2) the S&P 500 with dividends reinvested and (3) Cramer’s Actions Alert Portfolio. The latter are presumably the best of the best of the best of his innumerable recommendations. A chart showing relative performance is shown below. It looks like Cramer’s very best ideas have modestly underperformed the S&P 500 index since 2001 and meaningfully underperformed the S&P 500 with dividends reinvested. Notably, his performance seems to worsen over the years. I am frankly surprised that his best ideas did this well. But what about the several recommendations he makes each day which over time add up to hundreds or thousands. There is no record of performance on these, but if I were to hazard a guess, I’ll bet it would not be a pretty picture. However, we will never know as there are no records other than Cramer’s recall. I go to this detail on Cramer because to me he is the embodiment of the testosterone driven trading mentality. His underperformance with the best of the best of his recommendations suggests that investors would be better served by investing in an S&P 500 index. Warren Buffett is everything that Cramer is not. He does deep research on companies and invests for the long term ignoring short term market swings. His record is spectacular although he makes mistakes, e.g., his recent IBM investment. My approach to investing is Warren Buffet style. I am always trying to figure out where a company may be in five years and not try to call the short term. This can be extremely trying in the case of biopharma where sentiment can swing widely. It may seem puzzling that I try to have a long term approach to biophama companies which Buffet would never consider owning. However, the principal is the same in my opinion. All of this unmasking of Cramer and verbiage is for one purpose. I am an extremely patient investor and I do not change my recommendation on the basis of short term events as long as the reason for my recommendation hasn’t changed. In a report that is now in preparation, I go over my past recommendations, but for now I want to review my current recommendations. I start with recommended stocks which have a near tem catalyst that could have a major impact on the stock price. Cytokinetics The results of the phase 3 trial of tirasemtiv in ALS will be presented at a conference on December 8, 2017. Top line results will likely be released in November. Antares: The PDUFA date for Antares’ most important new product, Xyosted, is October 20, 2017. This will be followed by the launches of four other important new products over the following year. Northwest Biotherapeutics: The Company indicated at ASCO in June and again at a conference in September that lead investigators are preparing an article on blinded data from the DCVax-L phase 3 trial. Investigators have said that patients appear to be living longer than expected in the trial. This paper could be published in October or November. The Company has not guided on when it will release topline data for the trial which has been ongoing for nearly ten years and in which the last patient was enrolled nearly two years ago. As a guess, the timing for topline data is likely a matter of months. Portola: A manufacturing issue has arisen that could delay the launch of Bevyxxa beyond the initial guidance of November 2017 and into 1Q, 2018. An expected FDA response on the issue in November will clarify this issue. There is some investor concern that the FDA response which will clarify the potential launch date could delay approval beyond 1Q, 2018. The PDUFA date for the second major product AndexXa is February 2, 2018. My long term enthusiasm for this stock remains unchanged. I believe that its current valuation, the stock could be purchased solely on the prospects any one of its three late stage products: omecamtiv for chronic heart failure, tirasemtiv for ALS and CK-227 which is in phase 2 for four important indications. For the balance of 2017, the outcome of the pivotal phase 3 trial (VITALITY-ALS) of tirasemtiv in ALS will be the critical determinant of the year end stock price. Management has said that it will report the full data set at the Motor Neuron Disease Association’s international conference (ALS/ MND) in Boston on December 8. It will probably be the case that topline data will be reported earlier, probably in November. It will also report data from the phase 2 trial of CK-227 in the orphan disease SMA in 1Q, 2018. While this is not as important as the VITALITY-ALS trial outcome, it is still a key catalyst as it could establish proof of concept for CK-227. I continue to believe that there is a very good chance for success in VITALITY-ALS. The end point of the trial is slow vital capacity (SVC). In the earlier phase 2b BENEFIT-ALS trial this was proscribed as a secondary endpoint and was reached with a p-value of <0.0001. Also, the trial design and baseline patient characteristics of the two trials are comparable. The outcome of this trial will have a dramatic effect on the stock price. My guess is that if the stock is trading at $14 at the time of the topline release that success could catapult the stock price to $25 or perhaps much more. A disappointing outcome could drop the stock to $7. Importantly, in the latter case, I would be a strong buyer based on the prospects for either omecamtiv mecarbil or CK-227 alone. See my report of August 7, 2017, Cytokinetics: Reiteration of My Long Standing Buy Recommendation Based on an Extraordinary Pipeline (CYTK, $12.90, Buy) for more detail. The most important product is Xyosted, an injectable testosterone product that was developed and is wholly owned by Antares. It has shown superb pharmacokinetics (best of any product in the market) in a market in which PK is critically important. I believe that it could emerge as the best in class product in this $1 billion US market. The PDUFA date is October 20, 2017 and if approved on that date will be launched in late 2017 or 2018. Antares and Teva have developed an AB rated generic to Byetta. A legal settlement allows marketing after October 15, 2017 if the FDA approves the still pending ANDA. The companies expect to launch this product in 2017. Antares and Teva have developed an AB rated generic to EpiPen. Teva has given guidance that it believes it will launch in 1Q, 2018. Antares and Teva have developed an AB rated generic to Forteo. They hope to launch in some countries in Europe in 2018 and in the US in late 2018 or 2019. AMAG and Antares have developed an auto-injector that has advantages over Makena which currently has sales of over $400 million. The goal of AMAG is to replace all of Makena sales with the new auto-injector. The FDA target action date on the sNDA is February 14, 2018 and if approved, I would expect AMAG to launch the product within days. I continue to feel that the phase 3 trial of DCVax-L has a reasonable chance for success. I discuss the reasons in the recent report Northwest Biotherapeutics: Thoughts on Why the Phase 3 Trial of DCVax-L is Ongoing (NWBO, BUY, $0.17) So why is the stock selling at $0.17, has a market capitalization of $65 million and is teetering on the edge of bankruptcy? I have previously pointed out that I believe that NWBO has been the subject of a massive stock manipulation scheme as described in my report" Illegal Naked Short Selling Appears to lie at the Heart of an Extensive Stock Manipulation Scheme. “ I used to write on Seeking Alpha and I remember a hedge fund shill posting a comment on one of my NWBO articles saying that the wolfpack would make NWBO and its management so toxic that no one would touch the stock. They have largely succeeded. I pointed out in a recent article "Northwest Biotherapeutics: How Does DCVax-L Clinical Data Compare to the CAR-T Therapy Axi-Cel? (NWBO, $0.18, Buy)" that I believe that an unbiased observer in looking at the available clinical data would conclude that the data for DCVax-L is as promising as that for the CAR-T cells. However, the stock price is indicating that the phase 3 trial will almost certainly fail. If DCVax-L is successful in the phase 3 trial, it will be one of the biggest surprises in the history of biopharma and we could expect an enormous turnaround in investor attitudes and stock price. I would point out that KITE was just purchased for $11 billion by Gilead and that Juno which is the number three player in CAR-T therapy has a $5 billion market value. It is reasonable to expect the market capitalization of NWBO to increase dramatically from $65 million with success in the trial. Perhaps further adding to the upside is a massive short position, both legal and illegal. Some observers who have looked closely at trading in NWBO speculate that there may be 100 million naked shorts. Once again, I want to point out that there is a reasonable chance that the phase 3 trial will fail and it is likely that NWBO would go bankrupt. The failure rate of phase 3 trials for both small and large companies is high and particularly so for paradigm changing products like DCVax-L. Hence, the downside in the stock is zero. If you choose to invest in NWBO, you must recognize that you could lose all of your investment. However, success in the trial could lead to a $5 billion (Juno- like) or more market valuation. There are roughly 280 million shares and 90 million warrants outstanding so that a $5 billion market capitalization would lead to a stock price of $13 per share. A $1 billion market capitalization would result in $2.60 per share and $11 billion in $29 per share .Hence my buy recommendation. Portola received approval for the Factor Xa inhibitor Bevyxxa on June 23, 2017 for the prevention of venous thrombosis in hospitalized acute medically ill patients. Neither of the currently approved Factor Xa inhibitors, Xarelto and Eliquis, were able to gain approval in this indication. I see this drug as having blockbuster potential. The company also is close to gaining approval for another potential blockbuster, AndexXa, to reverse the effects of Factor Xa inhibition. The FDA has assigned this drug breakthrough status and assigned a PDUFA date of February 2, 2018. A manufacturing issue has arisen that could delay the launch of Bevyxxa beyond the initial guidance of November 2017 and into 1Q, 2017. See my report of September 6, 2017 for more information. An expected FDA response on the issue in November should provide clarity on this issue. There is some investor concern that the FDA response could delay approval beyond 1Q, 2018. We cannot be certain on when Bevyxxa will be launched until the FDA response in November. The expectation of the Company is sometime before the end of 1Q, 2018. AndexXa should be launched in mid-2018 if approved in February. My other recommendations do not have the pronounced near term catalysts of those four stocks, but this doesn’t mean that they do not have the potential for impactful events. I have described this company as having one of the best business models I have ever seen. Its products are used in the manufacturing of biologicals, principally monoclonal antibodies, which is the key driver of worldwide biopharma sales. Repligen products initially used in the clinical development stage and become part of the BLA filing. Once the BLA is approved, manufacturers are reluctant to change components of the BLA as this may change product characteristics and require FDA review or even a clinical trial. Hence, Repligen products are highly, highly likely to be used throughout the commercial life of the product enjoy predictable, long term recurring revenues. This is a way of investing in the commercial potential of monoclonal antibodies without taking the risk of binary clinical events. Repligen’s business model is in part driven by tactical, bolt on acquisitions. The Company has strong internal cash flow and a war chest of $154 million. This takes into account the $120 million cash component of the recent Spectrum deal. In the past, investor enthusiasm for acquisitions has usually caused an upside move in the stock as they lead to upward revision of growth prospects. There is this potential for a significant acquisition in the remainder of 2017 and in 2018. Investors are tremendously excited about the potential for CAR-T drug development, a sentiment that was heightened even further by Gilead’s $11 billion takeover of Kite which has no drugs on the market although it will probably gain approval late this year for Axi-Cel in r/r DLBCL. I have followed CAR-T drug development closely for the last three years and this led me to Cryoport. The manufacturing of CAR-T cells requires the shipment of living cells at cryogenic temperatures, which presents huge logistical challenges. Cryoport has come up with the dewar (container) technology needed to maintain these cells at cryogenic temperatures for 10 or so days, but arguably more important is its proprietary software that allows real time tracking of location and temperature conditions. I seldom stray into coverage of the big biopharm companies because they are well covered by teams of analysts at all the major brokerages. Also, they usually have broad portfolios of products requiring considerably more research than smaller companies that I usually choose to cover. Finally, the stocks seldom have the homerun potential of my smaller companies. The reason that I have broken the mold with BMY is that I believe that it is likely the most dominant player in the checkpoint modulator space which has explosive sales potential. It also has another blockbuster drug Eliquis in the anticoagulant space. The stock took a severe hit when the trial of Opdivo in first line lung cancer failed to hit its endpoint while Merck’s Keytruda did (in patients expressing >50% PDL-1). Then Merck was unexpectedly successful in first line lung with a Keytruda/ chemotherapy combination. BMY’s stock dropped from $75 in late July 2016 to $46 on January 26, 2017as analysts (over reacting) switched from anointing BMY as the dominant company in checkpoint modulation to MRK. This is unlikely to be the case but even so, being second in such an explosive market is enough to make the stock more than interesting. I reiterated my Buy in a January 24, 2017 report Bristol-Myers Squibb: Disappointing Recent Press Release Causes Sharp Drop in Stock Price; I Remain at Buy (BMY, Buy, $49). There is a potential catalyst in late 2017 when there is the potential that the CHECKPOINT 227 trial might report interim results on the combination of Opdivo and Yervoy in first line non-small cell lung cancer. This has the potential for the market to do another 180 degree turn and reannoint BMY as the industry leader in NSCLC and immunotherapy as a whole. This could produce a very strong move in the stock. The homerun potential could come from BMY being acquired by a still larger company such as Pfizer. I continue to recommend Agenus for its impressive technology platforms in immuno-oncology. It is difficult to assign a near term price target because of the early stage of its pipeline. A principal driving force behind my recommendation is that many large biotechnology and pharmaceutical firms are far behind in the checkpoint modulator and therapeutic cancer vaccine spaces. If they were to acquire Agenus, they could vault to a leadership position. I see a parallel with the Bristol-Myers Squibb decision to acquire Medarex which led to Bristol becoming the leading factor in the development of checkpoint modulators; Medarex had no program in therapeutic cancer vaccines. Immuno-oncology is one of the most dynamic areas of research in the world pharmaceutical industry. I think that Agenus has put together a cutting edge model for an immuno-oncology focused company and has a platform that many large companies who have fallen behind in this critical development space would covet. Agenus has an antibody drug development capability that makes it a leading player in developing checkpoint modulators. The Company also has over 20 years’ experience in therapeutic cancer vaccines and is building strong bioinformatics capabilities that will be important for effective use of its immuno-oncology drugs. I also see considerable potential for combining therapeutic cancer vaccines with checkpoint modulators. The Company has recently announced a strategic decision to spin off its cell therapy business so that investors will own two companies. Management feels that the market does not properly value the company as now comprised. This will leave investors with a leading company in the development of checkpoint modulators and a cell therapy company. In the case of checkpoint modulators, Agenus on its own has AGEN 1884 (a CTLA-4 inhibitor) and AGEN 2034 (a PD-1 inhibitor) in the clinic and its collaboration partner Incyte has two additional Agenus developed products in the market. There are a number of PD-1 or PD-L1 inhibitors in development buy Agenus has the third CTLA-4 inhibitor. The potential that a combination of a PD-1 and CTLA-4 could be a backbone therapy for oncology is an intriguing aspect of Agenus. I also note that Incyte has said publicly that it wants to acquire a PD-1 inhibitor. There is a vigorous discussion as to how a PD-1/ CTLA-4 combination will compare to an IDO/ PD-1 combination which I won’t attempt to go into. My guess is that both will find a major role. Agenus will begin a phase 1b trial for both AGEN 1884 and AGEN 2034 by the end of 2017. By the end of 2018, the company may have data that could establish proof of concept for both. In 2009, Bristol-Myers Squibb acquired Medarex for $2.1 billion which established BMY as a leader in checkpoint modulation. My most likely scenario is that Agenus’s checkpoint modulator business will be acquired within the next two years. If it were acquired at the $2.1 billion paid for Medarex, this would be $22 per share. This prospect drives my recommendation. I am not sure how to value the cell therapy business. I think that AMAG could surprise investors with how rapidly it converts its key Makena franchise into the new Antares developed auto-injector following its expected approval in February 2008. If so, this would likely spur a strong upward move in the stock. The remainder of the Company is a daunting challenge to analyze. As is the case with most specialty pharmaceutical companies it has made a substantial number of acquisitions making it a difficult analytical challenge. It also has a huge debt load although I would point out that it has strong cash flow. The failure of the phase 2b trial of Aerosurf was a crushing blow as I wrote in my report. Windtree Therapeutics: Phase 2b Trial Fails Although There Was an Encouraging Signal of Activity (WINT, Take tax loss, $0.34). The phase 2b trial failed, although there was an encouraging signal of activity. The failure was related to clogging of a cartridge used in the medical device that is used to deliver Aerosurf which affected some patients in the 50 minute dose cohort. In patients unaffected by this problem, results were positive and if they been replicated in the entire cohort the phase 2b trial would have been viewed as highly positive. I continue to feel that Aerosurf is potentially a paradigm changing product. However, the minuscule market capitalization of $10 million presents a possibly insurmountable financing hurdle. I think that Chimerix (CMRX, Neutral, $5.01) and Celldex (CLDX, Neutral, $2.66) lack catalysts for the next half year or longer. Both companies are funded until 2018, have good technology and good managements. I just see no reason to get involved. On Wintree have you studied the precarious financial situation of the company? the Debt? Science may be great but can they overcome their financial situation? I am painfully aware of the financial situation as I have written in my reports.